A growing number of U.S. airports are replacing their fossil fuel-burning courtesy buses with electric vehicles, spurred by the promise of smaller carbon footprints and lower operating costs. FAA grants that subsidize emission-free technologies and a smoother, quieter ride for passengers also sweeten the deal. Indianapolis International Airport (IND) is enjoying six new 35-foot-long, 25-seat electric buses made by Complete Coach Works, and it plans to take delivery of three more before the end of the year. 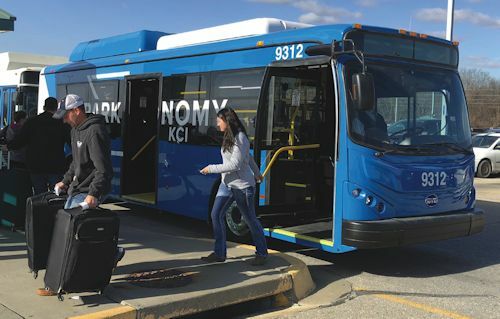 Last summer, Kansas City International (MCI) began operating four 30-foot-long, 22-seat electric buses built by BYD Heavy Industries; and officials are verbally committed to electrifying the remaining eight buses in the airport’s fleet during the next two years. Almost 20 Proterra electric buses are scheduled to go into service this year: ten 40-foot-long, 30-seat buses at Mineta San Jose International Airport (SJC); five at Sacramento International Airport (SMF) and four at Raleigh-Durham International (RDU). SMF’s new electric vehicles will supplement its existing fleet of buses powered by compressed natural gas. Reducing carbon emissions is a key factor in the trend. At SJC, for example, officials estimate that their new electric buses will eliminate 3.1 million pounds of greenhouse-gas tailpipe emissions over the vehicles’ 12-year lifecycle. IND officials estimate a 15 million-pound reduction in carbon emissions over the expected 10-year lifespan of the buses. 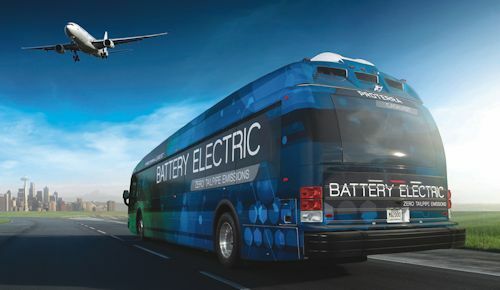 Another major aspect driving the purchase of electric buses is FAA grants from the Zero Emissions Airport Vehicle and Infrastructure Pilot Program created in 2012. It awards grants for up to 50% of the cost of zero-emission vehicles and associated infrastructure (primarily charging stations). Mario Rodriguez, executive director of the Indianapolis Airport Authority, reports that IND received two such grants totaling $3.6 million. The grants will defray part of the roughly $5.2 million cost of the airport’s nine electric buses. Similarly, SJC obtained a $3.8 million FAA grant to help pay the $7.6 million bill for 10 new Proterra Catalyst E2 buses, says Bob Lockhart, the airport’s deputy director of operations. General airport revenues will pay for the balance of the costs at both airports. MCI applied for, but did not receive, a zero-emission grant to help fund the $1.8 million tab for its new buses. The FAA denied its request because the airport isn’t located within an environmental non-attainment area. This means its air quality meets federal standards, explains Ian Redhead, deputy director at MCI. Even without an FAA grant, investing in electric buses still made sense, he adds. MCI was drawn to electric buses for the same reason other airports are embracing them: lower operating and maintenance expenses. BYD’s electric buses cost only 30 cents a mile to operate, says Macy Neshati, a senior vice president with the company. Fully charging the batteries for one bus costs an average of about $20 a day, he adds, noting that costs vary according to local electricity rates. In addition to its new electric buses, MCI currently owns a fleet of 26 buses powered by compressed natural gas (CNG). As a point of comparison, the cost per mile for operating those buses is about 80 cents per mile, says Redhead. Multiple factors contribute to reductions in operating costs, including no expenses for fuel, oil and transmission fluid; no cost to dispose oil and transmission fluid; and fewer repairs and maintenance needs, because electric motors have far fewer moving parts than diesel engines, he explains. Rodriguez says that electric buses will save IND about $2 million through reduced maintenance and fuel expenses during the 10-year lifespan of the buses. “With electric buses, you have to make sure the batteries are good and check the brakes occasionally, but you don’t have to do much else,” he remarks. Electric motors are more efficient, adds Neshati. “A motor attached to each rear wheel directly drives (turns) the wheel, which eliminates parasitic losses of power that occur with a conventional transmission and drive shaft,” he says. The basic technology that propels electric buses is similar, but manufacturers differentiate their products in various ways. Proterra buses, for instance, feature bodies made from advanced composite materials, which makes them lighter, more durable and easier to repair than conventional vehicles. While driving range varies according to usage, the buses sold to SJC can travel between 175 and 200 miles per day on a full charge and can be fully recharged in three hours. According to Lockhart, the airport’s buses drive between 150 and 200 miles per day, shuttling passengers between the airport’s two terminals and an economy parking lot. The base vehicles Complete Coach Works begins with are either 12 years old or have 500,000+ miles on them, and all are structurally sound, notes Sullivan. When rebuilt, they have an average range of about 150 miles, and their lithium-ion batteries can be fully recharged in about six hours. Rodriguez says buses at IND average about 120 miles of driving during each eight-hour shift. BYD Heavy Industries touts that it makes its own batteries, and that the company is the world’s largest manufacturer of rechargeable batteries. The lithium-iron phosphate batteries are designed to last two to three times longer than conventional batteries, and each includes a 12-year warranty. The fully recyclable batteries provide a driving range of up to 300 miles and can be fully recharged in about three hours, notes Neshati. MCI buses run about 120 miles per eight-hour shift, or about 360 miles per day. “We have three economy parking lots (with shuttle bus service), and we strive for no longer than a 10-minute wait for buses; so we run our routes often,” Redhead says. In general, electric buses usually cost more than diesel-powered buses, but they cost less to operate and maintain. Proterra’s 40-foot Catalyst E2 bus, for example, carries a price tag of about $649,000; a typical 30-foot BYD bus costs about $500,000; and a 35-foot Complete Coach Works bus goes for around $500,000. By comparison, a standard diesel-engine bus costs between $450,000 and $500,000, and a CNG-powered bus sells for around $700,000. “The payback periods [for electric buses] vary widely, but generally speaking, purchasers get an attractive return on their investment,” Horton says. “Payback generally comes within the first half of the lifetime of the vehicle; so it’s usually less than six years.” And the more miles the buses are driven, the faster the payback period, Neshati points out. Electric buses offer another benefit that often gets lost amid discussions of return on investment periods: They greatly improve the transit experience for airport customers and drivers. Why? Because the ride is significantly quieter and smoother. No transmission means no gears to shift, and no associated lunging. Plus, there aren’t any smelly exhaust fumes. Electric buses also help airports fulfill long-term sustainability goals inspired by stakeholders asking them to become more eco-friendly. As such, there’s more to consider than sheer economics.